Macintouch Reader Reports: User Interface Issues iOS/Lion – Carpet Bomberz Inc.
Don’t get me wrong OS X Lion is a good thing. But I am despising the migration of the mobile iOS system’s human interface design to the desktop OS. Gestures? We don’t need no stinkin’ gestures. Read On. Anyways, I predict a semi-chaos, where – for example- a 3 fingers swipe from left to right means something completely different in Apple than in any other platform. We are already seeing signs of this in Android, and in the new Windows 8.Also, users will soon need “cheat sheets” to remember the endless possible combinations.Would be interesting to hear other people’s thoughts. After the big WWDC Keynote presentation by Steve Jobs et. al. the question I have too is what’s up with all the finger combos for swiping. In the bad old days people needed wire bound notebooks to tell them all about the commands to run their IBM PC. And who can forget the users of WordPerfect who had keyboard template overlays to remind themselves of the ‘menu’ of possible key combos (Ctrl/Alt/Shift). Now we are faced with endless and seemingly arbitrary combinations off finger swipes/pinches/flicks etc. Like other readers who responded to this question on the Macintouch message boards, what about the bad old days of the Apple 1 button mouse? Remember when Apple finally capitulated and provided two mice buttons (No?) well they did it through software. Just before the Magic Mouse hit town Apple provided a second mouse button (at long last) bringing the Mac inline for the first time with the Windows PC convention of left and right mouse buttons. How recently did this happen? 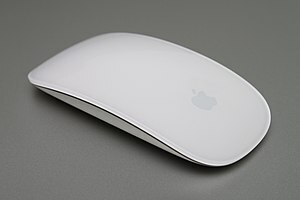 Just two years ago maybe, Apple introduced the wired and wireless version of the Mighty Mouse? And even then it was virtual, not a literal real two button-ness experience either. Now we have the magic mouse with no buttons, no clicking. It’s one rounded over trackpad that accepts the Lionized gestures. To quote John Wayne, “It’s gettin’ to be Ri-goddamn-diculous”. So whither the haptic touch interface conventions of the future? Who is going to win the gesture arms race? Who is going to figure out less is more when it comes to gestures? It ain’t Apple.